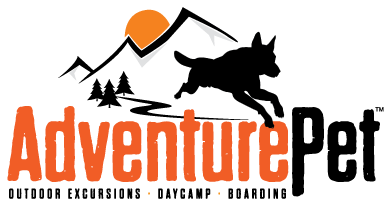 Our philosophy at Adventure Pet is “a tired pup is a happy pup,” which is why we offer so many options for our dogs to get the exercise and stimulation they need to be a well-balanced and content canine. From Outdoor Excursions in an off-leash pack setting to Solo Excursions for the dogs who need more one-on-one human to pup run time to DayCamp/boarding at Adventure Pet BaseCamp there are options to accommodate the varied needs of all dogs. When we designed our facility we started by surveying our clients. We knew they wanted us to be different than anything else in the area. So we started by asking them specifically what they wanted us to incorporate into the type of experience they wanted for their dogs who were boarding or spending the day with us. It was our goal to incorporate all these requests, which has created a unique facility. What is curbside drop-off and pick-up? Just like busy parents dropping off and picking up two-legged kiddos from school, our parents are usually on the run. We provide curbside service at BaseCamp with three access points to allow owners to easily get their pups in and out of the car and onto our property safely right at the curb. Our electronic check-in and check-out allows us to get clients in and out and on their way quickly. **Curbside drop-off and pick-up only available for clients who purchase a DayCamp package here at BaseCamp. What kind of outdoor play areas does BaseCamp have? Clients asked for plenty of outdoor time for their pups. They know how much dogs love to be outside, so we have optimized our property to allow for a high amount of outdoor play. In fact, we have the largest outdoor play area of any facility in the area, two acres. How big are the DayCamp play groups? We’ve learned during Excursions that pups love to play with a pack of their buddies. However, too many dogs in a group can stress out certain dogs making the experience of play time less than fun and create problems. Our handler to dog ratio is small and allow our staff to engage with the dogs, get to know them and really see how pups are managing in the group. Does BaseCamp have more than one play area? We have created several distinct play areas throughout our property. Each provides the opportunity for dogs to have different experiences throughout the day. These include indoor and outdoor time, water time (when the weather is warm) and open area relaxation time. This creates an engaging and stimulating experience so that dogs and handlers don’t get bored. Our dogs will cycle through these areas throughout the day. What is a splash park? How do you manage your air quality? We know that germs breed in the air when dogs are confined to an enclosed space without enough ventilation. We’ve installed a 15 ton HVAC system designed to turn over the air in our facility eight times per hour. The average home has a 1 ton system that does this once per hour. Our mission is to cut down on air born germs and create an environment that is clean and smells good. We know that our clients are busy, so making time to get pups to and from DayCamp and boarding can be challenging. Our facility is conveniently located in south Reno five minutes from the South Meadows Parkway exit from the freeway on the west end, and five minutes from the SouthEast Connector exit at South Meadows Parkway on the east end. Whether you live in Reno or Sparks it will be easy to bring your pups to BaseCamp! How secure is the neighborhood? While our location is easy to get to, it’s tucked away from main traffic and resides on a relatively quiet street with no pass through traffic. The South Meadows location is known to be family friendly and safe, providing you with the added comfort of security for your pups.